Beautiful colored ribbons stream from a clear hoop to provide visual excitement and flow to movement. Hoops are easy to hold, the 5" (12.7cm) clear plastic ring is almost invisible from a distance, which makes the ribbons appear to float through the air. 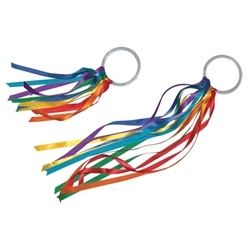 Seven tangle-free colored, satin ribbons represent each color in the rainbow. Knots are glued so the ribbons can't be removed from the hoop, although they do slide freely around it for other creative usage possibilities.